Students! Looking for a Self Help or Federal Work Study position? Want to earn spending money and boost your resume? Look no further! ECU is hosting a student job fair to match students with employers on, and around campus. The event will be held in the Great Room in Mendenhall, from 10am to 2 pm, September 14th, 2018. Dress to impress and bring copies of your resume! Please bring your One Card, and Banner Id. 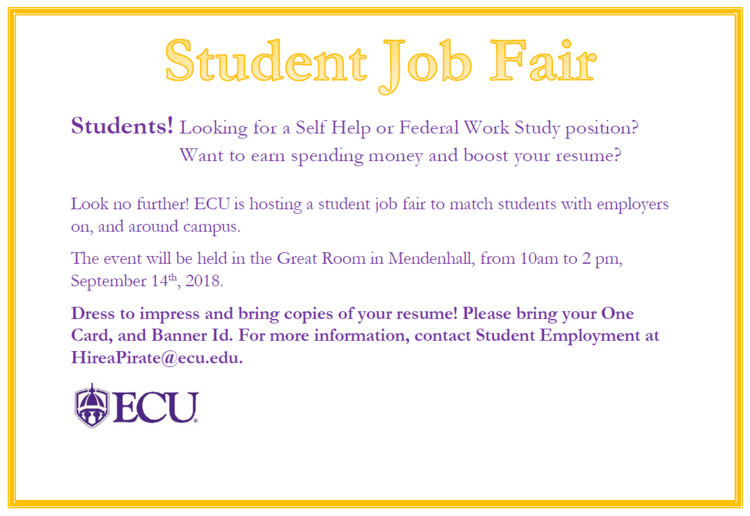 For more information, contact Student Employment at HireaPirate@ecu.edu.